My second Farmers' Market dish was a little disappointing. 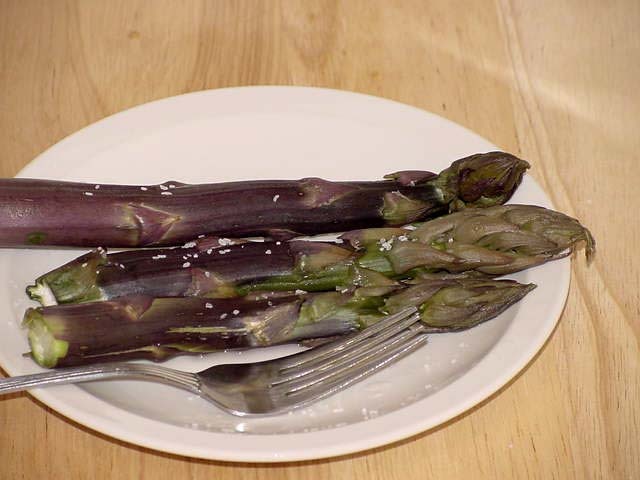 It tasted ok, but it didn't really highlight the green garlic or the purple asparagus the way I hoped it would. There are a couple of reasons for this. First, I chose the wrong herb. I don't know what I was thinking because I was trying to keep it light and spring-ish. My first thought was tarragon. That would have been a good choice, but unfortunately I didn't stop there. For some reason I decided that was not the way to go and decided that thyme would be good. But not even five seconds after I added it to the pan I knew it was the wrong choice. So then I added the tarragon, thinking that might lighten it up a little. Better, but the thyme was still too much of a presence. So I added a little oregano, which oddly enough did help. Next time I will stick to my original idea and use tarragon. Or better yet, use fresh basil. I don't like dried, so I didn't even consider that. I also used the wrong pasta. The thing about whole wheat pasta is that some shapes are thicker and chewier than others. 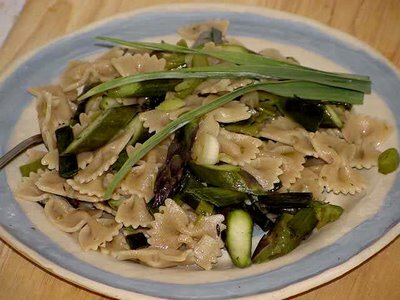 Farfalle is dense and works better with something that has more sauce so it can soak it up. I should have used something lighter, like rotini or gemelli. You can see how thick and gooey the farfalle looks. Not my most visually appetizing dish, either. That being said, I did enjoy it, and know what to do next time to make it work. It was especially good the next day at room temperature. 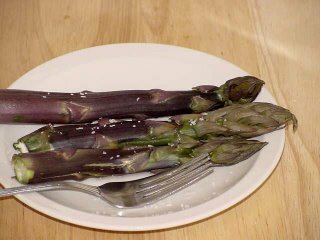 Here's a picture of the biggest of the purple asparagus. I put the fork there to give some idea of scale (that's a salad plate they're sitting on) but I don't know if that does it justice. Those suckers are humongous.